deemed to have deserted if he/she proceeds for studies. the Commission will consider late application. The original copy will be forwarded to TSC by The County Director. The triplicate copy will be retained in the institution. a county’s primary school’s teacher population. teacher on study leave from a department at any one time. 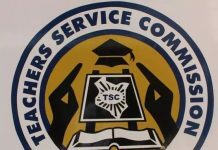 worked for the Teachers Service Commission for five years. is not in the school curricula or in the Study Leave Policy. except for KISE certificate cases who will be required to serve for one year. the Teachers Service Commission Headquarters at the end of each semester. course will not qualify for any other leave thereafter. programme for which the leave was granted or expiry of the leave. Service for varying periods based on the duration of the leave. programmes will qualify for a maximum of 3 months leave to carry out research. However, this leave cannot be extended.